Often when we hear of a story involving business owners calling the police on customers the initial reaction is shock and dismay: If the customer is always right, how can a seemingly simple case of noisy kids lead to police involvement? It’s often more complicated than that, as we found out after a media report about a family upset that an Applebee’s manager kicked them out and called the cops. According to a report by KHOU 11 News in Houston, the parents of a 3-year-old and 1-year-old boy admitted their kids were “active,” and said they’d been acting up a bit at dinner on Sunday night. In that account, KHOU says the manager approached the father and said the children were being too noisy, ordered the family to leave and said he’d called the authorities. “When they walked outside, they were confronted by a Harris County Sheriff’s Deputy. The deputy gave them a notice warning them for criminal trespassing,” says the KHOU reporter. As it turns out, explains Alan Bernstein, the Director of Public affairs for Harris County Sheriff’s Office when contacted by Consumerist, the police didn’t confront anyone: After the Applebee’s manager called the police “to get assistance in evicting the family,” the father of the family also called the police and said they felt threatened by the manager’s actions. The Sheriff’s office said officers would wait for the party in the parking lot. Once law enforcement arrived at the request of both the manager and the father, Bernstein said officers saw no need to warn anyone or file any charges. Bernstein points out that the “warning for criminal trespassing” — which ostensibly is meant to mean a piece of paperwork shown in the news footage — is in fact not a warning or citation of any kind. Instead, it’s a citizen’s info card (as denoted by those very words on the top right corner) simply providing a reference number for the case, so that anyone involved in the situation could follow up. He reiterated that no charges were pressed and no arrests were made. As a brand, our focus is and must always be providing the best possible experience for all of our Guests at all times. When a disruption in our restaurants affects any of our Guests, it is the manager’s responsibility to step in to resolve the situation. It is exceedingly rare that a situation requires the assistance of law enforcement, and our franchisee is using this instance as a teaching moment to better manage future disruptions in their restaurants. Can kids be bad and act up in public places, often thwarting their parents’ best efforts to make them behave? Yes. 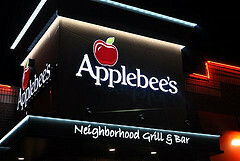 Are families going to eat at restaurants like Applebee’s despite the possibility of bad behavior? Yes. Combining those two can lead to some noisy moments, but it’s to be hoped in most cases that the police don’t have to get involved.